Everyone is always seeking a short cut in attempt to save time. As New Yorkers we feel that we are at a constant race against the clock. It's a shame since we tend to miss out of the most simplest, yet satisfying things. The downfall of this is that we tend, whether we admit it or not, to settle. We can all think of examples of when we do, be it our jobs, our lifestyle, our choices, or our eating habits. At times for instance we settle for fast food or take out because again, we "have no time to cook." Instead we settle for the deli on the corner, for McDonald's, or anything that "gets the job done." Again, a shame. Don't get me wrong there are times when we are all at a pinch, and desperate measures cause us to do what we must. But, if we could make the time to make slight changes the outcome would be far enjoyable. Take for instance stock. Yesterday I was teaching a class at Camaje and during our talks a client mentioned the can of stock she picks up at the local market. I had to break the news to her. First, the brand and can she was referring to was not stock at all. It was broth. I then explained the difference: While both may involve the simmering of veggies, herbs and meat, a stock includes the bones. The bones add body to what would be otherwise a broth. Since bones provide gelatin, a good stock should be gelatinous--it should basically have a Jello-like appearance. Now that we cleared that up, we can think of the boxed stock we also see at the market priced at $3.50 or more depending on the brand. Usually the texture seems broth like, the biggest visual difference is that the boxed stock appears a bit amber or deeper in color. The lack of body is a problem. Secondly, the amount of salt is outrageous, even in the low sodium versions. This makes flavoring a recipe difficult since you have to taste the stock you are working with to actually determine how much salt you can add in your recipe. This places limitations on the cook. So what is a busy person supposed to do? Well how about make your own stock. I, considering my new late work schedule have the luxury of having the day to myself, so making a stock that simmers for 3+ hours works with me. In case you would like to give this a try here is what I do. 2. Add veggies. Think mirepoix=carrots, onions, celery. Don't bother peeling or dicing. Snap the carrot, celery in half as is and the onion cut down the middle. Toss in smashed garlic--skins on. If you have leeks, scallions add those too. 3. Throw in herbs like thyme and parsley stems (avoid harsh herbs like rosemary, again you want to control the taste and use this base in diverse recipes). Add about 6-10 whole peppercorns and a small pinch of salt. 4. Fill with cold water to cover. Simmer. The heat should form bubbles up top showing that things are actually happening in the pot, but low enough to to prevent it from boiling or having vigorous bubbles. 5. After a few hours strain. Fill into quart containers (Chinese food take out plastic containers come in handy!!!) and put some in ice trays that you will only designate to this. This allows you to dump a bit in if a recipe only calls for a small portion of stock. Once cool REFRIGERATE! Or Freeze the remaining portions. You DO NOT want to leave this out sitting around--DANGEROUS. 6. Add to your favorite recipes. Make pan sauce, add as a base in rice dishes, replace water with stock in certain dishes to add another dimension and if nothing else make chicken soup! Point is, we are all busy people. We all work hard....but we should play hard to....otherwise is it really worthwhile? By putting in a bit of effort the possibilities are endless. So make stock and enjoy one of cooking's most essential flavors--You owe it to yourself! After writing my blog on Alice's Tea Cup I was very happy to come across an article in The BBQ Issue of Bon Appetit called Cooking Life/Maine Attraction by Molly Wizenberg. The article expresses the author's appreciation for scones. After a mother-daughter vacation in New England she visits The Standard Baking Company where she falls in love with a blueberry oat scone: "I would still be there today, sitting on the deck out front with a cup of coffee and a scone, if it weren't for our pesky return tickets." After deciding to beg the owners of the shop for the recipe, she then scaled it down for the home kitchen and included a few tweaks she made. Fortunately for us, Mrs. Wizenberg doesn't just tempt her readers by providing us with the mouth-watering details, she actually provides us with a way to gain the same satisfaction at home! Blueberry Oat Scones consist of all the ingredients that cooks usually have in hand, flour, brown sugar, baking powder, kosher salt, unsalted butter, old-fashioned oats, vanilla extract, half and half (okay, I didn't have this on hand so I used equal parts milk to heavy cream), and raw sugar (I usually have extras packets from my frequent visits to Starbucks) and fresh (or frozen, but if so don't thaw) blueberries (or whatever berry you prefer or that's in season will do.) BTW, feel free to add a few spices. I added cinnamon and cardamom about 1/4 tsp each. The whole process takes less than 20 minutes to put together thanks to the help of a food processor. Next comes the scooping. I lined a baking sheet with parchment paper then used a medium size ice cream scoop to get healthy, even sizes. Also, make sure you leave enough room in between each scone. Sprinkle with raw sugar, oats and off to the oven they go!!! Without a doubt, there is no better smell than scones baking early in the morning! (well perhaps the smell of bread, but you get my point!) My goodness, absolutely fantastic. It sends a warmth through the home, not to mention the spine. After 15 minutes at 350 turn the sheet pan to allow even cooking, then 12 minutes later it's ready!!! I know the recipe ask that you cool slightly, but I think the word "slightly" is left to our discretion, as for some that may mean anywhere from 5-12 minutes, but for me it meant 45 seconds! Strike it while its hot is my motto! And boy was it as good if not more delicious than Ms. Wizenberg described: Crumbly outside, moist inside, not too sweet (as you could serve with clotted cream and preserves remember). The scone served as the perfect example of balance in texture and flavor. Outrageous! Excuse me, I appreciate you reading this and all, but why are you still here.....go ahead make a batch and if you can resist the urge to keep it all for yourself, set some aside for friends you adore. Trust me, they will love you for it! A few years ago Burberry had a cafe upstairs called The Mad Tea Cup. Here customers could take a break from shopping, drop their bags, take a seat and enjoy 2 scones and a pot of tea of your choice. My mother in law, my husband and I loved the calming nature and indulgence that afternoon tea provided, especially after a long day of painting the town red. Come to think of it, they were numerous times when we visited Burberry not for their cashmere scarves, plaid purses, or leather goods, but for the little treats that awaited us upstairs. Sitting on the high stools and enjoying a warm, crumbly (but soft biscuit like inside) scone, with preserves and Devonshire (clotted cream) on the side, and a cup of Earl Grey was worth far more than any of the luxuries that decorated the store. Regardless to what scone of the day was being offered--chocolate chip, pumpkin spice, mixed berries--we knew we would not be disappointed. One afternoon we took the elevator straight to the 3rd floor as usual, but noticed that our wonderful cafe was replaced by manikins. No traces or evidence of the our treasured cafe--that was up and running just days ago--existed. Saddened, we left Burberry and knew that with our exit we left behind cherished times. Of course we would return to shop, but no longer would it be a place of refuge. One day I stumbled on an article on a cafe called Alice's Tea Cup. It turned out that the owners of this tea shop had opened my beloved Mad Tea Cup. Needless to say I couldn't wait to pay a visit. I must admit, the vibe is completely different from their cafe at Burberry. However, I was happy that my love affair for afternoon tea could continue. Alice's Tea Cup offers wonderful afternoon tea, served by waitress wearing fairy wings, reinforcing the magic that comes with such an experience--one that we were so fortunate to relive time and time again. Again stumped on where to go on a beautiful Saturday afternoon we decided to tour City Island. Convenient, a short drive and a new attraction! (btw you can also take MTA there) Upon arriving it's hard not to be taken aback by the beautiful views of the ocean, surrounded by boats and people who seemed to be taking it easy--plain and simply it felt like we left NY behind for a bit! The strip of land that makes up City Island is filled with little shanty seafood restaurants--which is all you could possibly want to eat considering the ocean front views. Overwhelmed by all the choices, we weren't sure where to eat. So in the words of EVOO, I decided to "ask the locals" which I must admit is very good advice from Rachel Ray. We stopped a lady who was out running errands and she suggested two places: a real sit down restaurant (the way she described it seemed like a spin off of Benihana). The second, a very touristy, no fuss spot with pretty decent food and high turnover. I wanted a place that we could pig out and enjoy the breeze. I also figured since we "left" NY I also wanted to get away from the stuffiness you usually put up with in NYC restaurants--which don't get me wrong, can be fine, but today I was in the mood for grub. So the choice of where to eat was clear. We were off to Johnny's! Observing the atmosphere, which is a bit different from we are use to (not to mention the cafeteria like structure), made me doubt the nice Samaritan. But to her credit, it was packed (but they offer a lot of seating so don't worry), very decently priced, and the food couldn't leave the counter fast enough (which translated to me as fresh since the food didn't have time to lay around). 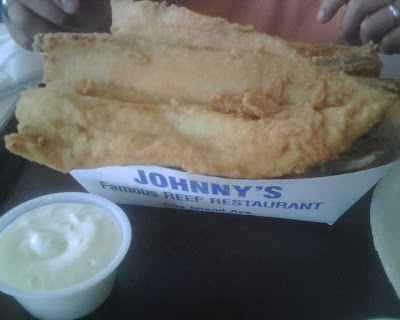 Alex and I shared the fish and chips, with some tartar sauce and a bit of hot sauce I was in fish heaven. It was just what my body needed and exactly the perfect ambiance we not knowingly must have craved. So, our little local was in fact spot on! And so visiting City Island, it gave us the opportunity to relax and enjoy life as if nothing else in the world mattered. Sometimes your mind and body needs just that. Now that I no longer revolve around a 9-5 schedule a great mentor of mine-Micol Negrin, suggested that I use the time to improve on recipes and techniques. So, I have been focusing on desserts. Nothing complicated or overly sophisticated, rather dishes that reflect food I love--comforting, clean flavors achieved for everyday pantry items that are extremely delicious. After driving up to the Hamptons this weekend we stopped at my favorite gourmet market, Citarella. Along with a ton of little items, I purchased a loaf of brioche. Two days later, and back in my NY home, I still haven't eaten a piece of it. Rather than allow it to go stale, I searched Food Network for a bread pudding recipe. With 31 reviews I happily stumbled on the Neelys' Rum Raisin Bread Pudding. It couldn't be easier to put together. In a saucepan, warm 3 cups of milk, 1/4tsp of cinnamon, 3/4 cup of brown sugar (I used light brown); 1tsp of vanilla; 3 tbs of dark rum and 1/2 cup raisins. I also, added 1/4tsp of cardamom, a pinch of salt to round out the flavors, and a stick of cinnamon to infuse the flavors. Bring to a gentle simmer. (I let it simmer for 15-20 minutes) Meanwhile, cube brioche (7-8 slices) into medium cubes and set aside. Then add warm milk mixture over bread, stir and let sit for 30 minutes. After, beat 4 eggs and add to milk-bread mixture, stir and place in buttered dish. I dotted bits of butter on top and gave a light sprinkle of granulated sugar on top in order to achieve a golden crust. Bake for approx 50 minutes at 350 degrees. You want the bread pudding to be golden, crisp and moist inside, so don't overcook. Allow to rest and serve alone, or with whipped cream, or a little warm chocolate sauce (and whipped cream). As you may notice from the photo, I couldn't help taking a small nibble. It was warm, well balanced, deliciously moist and the hints of cinnamon and sweetness of the raisins came together perfectly. Considering its rainy out, it would taste fantastic in bed with a book. Either way, definitely make this easy recipe and spike it up a bit to make it your own. Trust me, the mere minutes it takes to put together is worth the warm and Autumn like scents emitted and the warm comfort it provides to the tummy. It was my mother-in-laws birthday this weekend and as per her request we headed to the Hamptons. Our first trip there this spring! My aunt joined us and we all took the 2 hour drive to relaxation. I thought a good way to kick off her special day was to stop at Wolffer Estate Vineyward. I must admit, I may not be much of a red or white wine fan, although I do try to appreciate a good glass every now and then. I am however a fan of rose. We ordered a very modestly priced bottle and sipped away while munching on a cheese platter. It is just amazing to sit outdoors and overlook a vast field filled with grapes. Sitting there enjoying the fresh air and unwinding was indeed a perfect way to start what was a wonderful birthday celebration. BTW, last year the rose from Wolffer sold out as it made for a lovely, clean, refreshing drinking wine esp. during BBQ season and they predict a sell out by July for this year's rose. My advice is to grab a bottle or 2, or a case if you are planning a lot of entertaining. Trust me, you won't be disappointed.